7:30PM Tickets still available and at the door. There is still time! Get your tickets for the Magic, Mind Reading, and Hypnosis show this Saturday night at 7:30PM. Come experience Mat LaVore perform impossible magic, read minds, hypnotize people to forget their own names, and even predict the future in his critically acclaimed “magical masterpiece,” “Magic & Mystery”. Mat LaVore has taken the very best of all the mystery arts and blended them together into one unforgettable show that always leaves audiences astonished long after they leave the theatre! 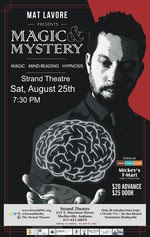 Don’t miss out on “Magic & Mystery” this Saturday August 25 at 7:30PM. Tickets are still available. We are tired. Two weeks, two monster setup shows. 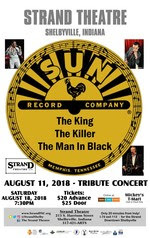 The King, Killer, and the Man in Black took extensive setup but nothing compared to the Beatles Tribute Concert. Work for the Beatles show started immediately after the KKMIB concert. We had to build a set, refocus our lightings, and most importantly execute a sound plot that was the most extensive we have ever done. (Warning, tech talk ahead) The set was designed to mimic the Ed Sullivan set in 1964. While not difficult it was very time consuming. A theater should always stock black paint. We are glad we did, as all the framing for the set needed painted black. We utilized our Stage Floor Gray and our wall colors too. When done we accomplished what we needed. David F., Bill W., Bob S., and Floyd N. all worked on the set in three marathon sessions. David’s design worked well. Our lighting hasn’t been right for several months. We had to focus every lighting instrument to make sure they were exactly as the light plot specified. We also had to refocus (for the first time) all our LED stage lighting. With the addition of a few “specials” or auxiliary lights, we were able to have flexible and varied stage lighting for the concert. The lighting design, which was integral to the set design, came out as planned. Finally the sound setup. Wow was it a Duesy! It utilized almost all our equipment. In order to even consider booking a concert like the Fun 4 Beatles Tribute, a venue must have the necessary equipment. The band flew in from Florida the day of the show. The only thing they brought were costumes and guitars. Everything else had to be provided by us. First off big thanks to Alan McDaniel and Jeff Sponsel. Alan lent us his 1966 Ludwig Cocktail drum set, identical to the original that Ringo played. He also lent his 12 string Rickenbacker guitar. Jeff lent us his wonderful Roland G8 keyboard. Jeff also helped the band set up the proper sounds from the keyboard. Without those three instruments, we would not been able to have a concert. Thank you Alan and Jeff! The setup required 8 Direct Input (DI) boxes, 6 vocal mics, 2 drum mics, 5 monitors, 19 XLR cables, 10 ¼” patch cables, 6 boom mic stands, 1 kick drum mic stand, and 6 extension cords. We utilized our upstage and downstage snakes. We had to repatch our monitor sends in our main snake to the sound board, along with providing a send to an in ear monitor. That is a lot of stuff! Steve F. got things set up and Joey G. finished things off. The sound check was extremely technical with technically demanding fine tune requirements. We used 38 of our 40 board channels including our reverb unit. These are all things designed by Ron B. years ago as “must haves” in a performing arts space. Our only goof was building the platforms for Ringo and not being able to lower our movie screen for Friday Night Frights. We worked hard to get the word out that the FNF movie was cancelled, we didn’t get the job done. We had about 20 patrons arrive on Friday night. Sadly a group from Muncie made the trek down. 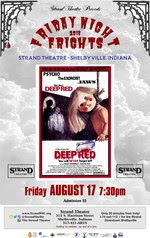 They were good sports and hopefully will be back on August 31st for the rescheduled showing of DEEP RED (1975) for the missed Friday Night Frights. Thank you once again to the Shelbyville News and WSVX Radio for helping us market the show. For the Elvis show you might remember we were able to sell 140 ticket in the last 24 hours. For the Beatles show we sold 132 in the last 24 hours. It saved us! We were thrilled with the power of local media. We think the 132 that bought the tickets are glad they did, as it was an over the top show. After the concert several patrons made the trek to the Skyline Drive-In to watch the 50th anniversary showing of YELLOW SUBMARINE. 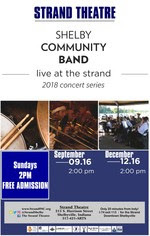 Thank you to everyone who attended, Joey G. for getting this show going, and band leader Bryan Wilson (John Lennon) who had faith in the Strand and agreeing to perform in Indiana. Thank you also goes to former Strand Board member Gary Nolley for arranging all the flights back in February. It was a group effort. This week we inventoried, checked, and labeled our sound equipment. It is a long overdue project, but will make things simpler in the future. We also received word from Coke that we should be ready to move our equipment out of the basement up to the lobby level in a few weeks. We are looking forward to that! We have been fighting a few gremlins, but for now we seem to be winning. Hopefully that trend will continue. 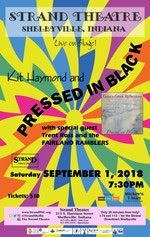 Kit Haymond and his band PRESSED IN BLACK will return to the Strand on Saturday September 1, 2018. It will be nice to welcome Kit back to the Strand’s stage. He will be joined by Trent Moss and the FAIRLAND RAMBLERS. This is a chance to hear both groups in a concert hall setting without any other noises or distractions. We look forward to the concert. Tickets are available at Mickey’s T-Mart (cash or check only) or at the door. Admission is $10. We are working hard at our 2019 season. We have over 77 performances already booked including the Shelby County Players, the 38th Infantry Division Army Band, a Buddy Holly tribute. It will be a great year. We hope you have enjoyed our programming. We do it all because of you, thank you! See you at the Strand. Friday Night Frights – DEEP RED – August 31, 2018 – NEW DATE! We goofed! The Beatles Concert on Saturday Night (tickets still available) has a set to resemble the Ed Sullivan Show appearance. Ringo sat on an elevated platform. The platform was built and is in the middle of where the movie screen is lowered. Unfortunately the platform is built into place and we cannot lower our screen for Friday Night Frights. On the bright side, the Beatles set will look great! It was quite the “ah ha” moment when we made that realization. The movie is rescheduled for August 31, 2018. Comments Off on Friday Night Frights – DEEP RED – August 31, 2018 – NEW DATE! 8PM Tickets still available and at the door. We goofed! The Beatles Concert on Saturday Night (tickets still available) has a set to resemble the Ed Sullivan Show appearance. Ringo sat on an elevated platform. The platform was built and is in the middle of where the movie screen is lowered. Unfortunately the platform is built into place and we cannot lower our screen for Friday Night Frights. On the bright side, the Beatles set will look great! It was quite the “ah ha” moment when we made that realization. We will reschedule this film. The Beatles show will be fantastic! This will be a wonderful concert featuring outstanding music performed my top flite tribute musicians. It also includes multimedia presentations. Plenty of tickets are available and will be available at the door too. See you there! Thank you to Cagney’s for helping us out this week. Our Coke ran out last Thursday night. We knew we were close, as our delivery was scheduled for Tuesday. With two performances, Cagney’s came to the rescue! We had to reconfigure the theatre this week for the Beatles show. As discussed last week we hung our small movie screen. This job was not easy, but the hardest part was figuring it out. The actual work zipped along. It went as planned, almost. The screen will be in place, albeit temporarily for the show. We will permanently fly it in the coming weeks. We also built the set for the show. Remember when the Beatles performed on the Ed Sullivan Show? (Editor’s note: If you are too young to remember, click here) We built a representation of the arrow set on the Strand’s stage. Thank you to volunteer Floyd N. for helping with this task. Did you notice all the Mystery & Magic posters around town? Mat LaVore’s marketing team did a great job getting the word out for his August 25th performance. We are excited about his performance. The night will feature Hypnosis, Mind Reading, and Magic! It will be fun. Maybe we will get a few of our volunteers on stage to be hypnotised too! Posters distribution is something that we do not do well. We have wonderful posters produced by a variety of graphic artists. If you are interested in volunteer and helping distribute posters, please respond to this email or call 317-395-3318. Not all our events have posters, but we typically have 6 to 8 performances per month that do. The King, Killer, and the Man in Black took a tremendous amount of work and coordination by our volunteers. Work started at 7AM last Saturday and continued until the show started. The setup was complex and we have been dealing with some equipment failures that make it more difficult. The problem is from overuse, which we think is a good problem to have! The show required our sound and light crew to be on top of things the entire concert. It was a workout! The concessions crew had their largest night in several months too. The large crowd restored our faith in our programs being supported! All our volunteers and patrons were spent after listening to all that high energy music! Thank you to all who supported this show and the Strand. Remember tomorrow is our Beatles Concert. Let’s have a repeat! Speaking of overuse our projectors had the same fate this week. (warning, tech talk ahead). We control our projectors from a cables strung from the projector tree above the balcony to the sound board. This snakes through the ceiling, into the projection booth, into the balcony structure, down a support column, into the old tunnel under the floor and up into the soundbooth. The cables transmit the commands to each projector (we have 2). Both systems failed…ugh! The Beatles show needs the top projector and Friday Night Frights needs the bottom projector. After lots of volunteer hours we were able to isolate the problem. A quick call to Steve Dennis Electric and Steve was there with the proper testing equipment to verify and fix the issue. We are good to go. This summer has been the best yet, but the most challenging too. We want to thank our media partners at the Shelbyville News and WSVX Radio. We also want to thank the Shelby County Chamber of Commerce. They all did an outstanding job of helping promote our concert on Saturday. Did you notice the front page of last Friday’s Shelbyville News? How could you miss it. The article and page design were fantastic. Did you catch the interviews and talk on WSVX? Equally fantastic. Going into Friday we had sold 40 tickets. That was not good. Greatly due to the radio and newspaper we sold 130 tickets the final 24 hours! If you ever doubt the power of local media, we are willing to give testimony that it works. Everyone who came into Shelbyville saw our concert on the Chamber’s sign. The Chamber faithfully distributes our events and newsletters each and every week. We are proud to be an advertiser in the Shelbyville News, and advertiser on WSVX Giant 96 and a member of the Chamber of Commerce. The audience was treated to almost 3 hours of continuous music. The energy was so high it even wore us out. It will take us until October (when Terry Lee returns) to recoup. We love it when people dance in the aisles. There was a whole lot of shakin’ going on. Tomorrow is the final concert in our summer concert series. We hope you can attend. Next Saturday is Mat LaVore with Mystery & Magic. 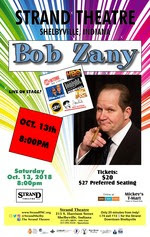 It will be a new and entertaining evening at the Strand. We do this all for you our community. From time to time we get down as the pressures of supporting our performing arts center are tremendous, then something happens like selling 130 tickets in a single day that restores our confident in our community . Thank you. See you at the Strand! 7:30pm – Tickets still available! Before the concert on Saturday we urge you to visit the Shelby County Fairgrounds for the first BIG BLUE BARBEQUE FESTIVAL. Get your grill on for this nationally sanctioned BBQ event. It starts at 10am so plenty of time to visit before our concert. 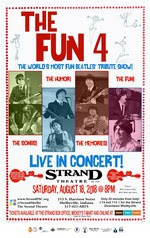 Next week on Saturday August 18th we host an outstanding BEATLES CONCERT featuring the FUN 4. The Fun 4 is comprised of musicians from Florida and Arizona that have toured the country performing high quality Beatles tribute concerts. 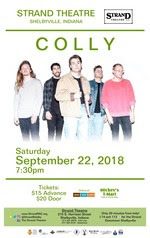 Tickets are still available locally at Mickey’s T-Mart (cash or check only) or online at BrownPaperTickets.com We hope to see you! This week we hosted our first ever OPEN MIC at the STRAND. Wednesday saw 6 musicians taking their talent to our stage. Host Mike Evans welcomed Erich Davies, Jocelyn Sadlowski, Kari Snepp, Ian Hall, McKenna Hall, and Jim Wendel. (Local musician Bob Rogers was late in arriving and was not able to perform) It was a fun night. Mike Evans is witty and excellent MC! Thursday Night we welcomed the comedy crowd to the Strand. Host Lissa Sears ran the evening for the Strand. Lissa came to us via our friend Todd McComas. She has opened for Pat Mcafee and is a funny person! We had 3 test their comedy on our stage. Each did a great job. Since it was a low turnout we suspended the five minute time limit. The evening finished with comedian Artie Widgery who came to support our efforts with open mic. Thank you to all who attended or performed in our first two nights of OPEN MIC. We continue tonight (Friday) with open stage night. Our host will be hip hop artist Kid Quill. We don’t quite know what will be on our stage, but take a chance with us and come tonight. The performance starts at 7:30pm. We are hosting a work session this Saturday to prepare for upcoming performances. Top of the to do list is to “fly” or hang a new projection screen. (Warning, tech talk ahead) Back in the day, the Strand then called Cinema 3, had two theaters downstairs and one in the balcony. The movie screen in the 49 seat small theater to the right in the auditorium has been saved by the Strand since we started in March 2007. That screen has survived all these years being shuffled from place to place. It is time to press this old movie screen into service. We are hanging it off of the original 1916 rigging in the ceiling above the stage. These pulleys were installed to fly scenery. They are being reused to fly this smaller screen that will be used for the first time at our Beatles Concert on August 18th. This is a major addition to our cache of equipment we can use for our performances. If you can help, we will be at the Strand starting at 9am and should finish around noon. We fought other gremlins this week too. The Shelby County Players wanted us to move our auditorium exit sign along with the alarm strobe and pull station. This had to be done professionally. These items are made to be installed and left alone. When we placed them back in their original location on Wednesday the pull station would not work. This is a deal breaker, no pull station no performance. After over an hour of work the two electricians and one Strand volunteer discovered the problem. It was an odd problem, but an easy fix. Our afternoon didn’t quite go as planned! Work is continuing to prepare our offices and projection booth. The offices have been on hold pending approval of funding from Mainstreet Shelbyville for professional restoration of our office windows. When we removed the boards from the windows over a decade ago, we did those windows with volunteers. We did a good job, but not a professional job. They have since failed and are preventing us from using our newly reclaimed office space. Window restorer (and Strand performer) Jim Wendel from Moscow Millworks will be doing the work should funding be made available. The Strand volunteers will still be doing work, but things like outside painting. We should find out this week whether the project is funded or not as part of the Mainstreet Facade Grant Program. Finally we are still working on the gremlin causing our lighting system to “flash.” We have an idea, but it is labor intensive to test out the theory. One way or another we will get this solved too. Open Mic has been fun. Doing something different is always fun. This is all because of your interest and support, thank you. See you at the Strand! Radium Girls – Friday, Saturday, Sunday!! August will also include OPEN MIC! We have a great lineup. We need your support. Please consider attending one (or all) of these events. We are proud to bring top flight local, regional, and national entertainment to the Strand. Parking hasn’t been a problem, we just don’t have our spaces on Harrison Street. Is it possible to change someone’s memories? Read minds? Predict the future? Find out by coming to the Strand Theatre on August 25th. Nationally touring magician and hypnotist, Mat LaVore, will be bringing his critically praised theatre show, “Magic & Mystery” to the Strand’s stage ONE NIGHT ONLY. You will not want to miss this. Are you a Harry Houdini fan? Come see LaVore perform one of his most famous magical feats! Strand Fun Fact: Smelzer’s Jewelry Store was located in the Strand Building. It was in the storefront where our current concession stand and men’s bathroom is located. Chet Smelzer sold that business to Mr. Connor. It moved a few doors down and operated another two generations. We have a ring box in our collection that is from Smelzer’s Jewelry Store. We are hard at work booking our 2019 season. This week the Strand met with Alex and Sarah from the Grover Museum. We are working on collaboration for 2019 events. On the list that was discussed is the 60th Anniversary Buddy Holly Tribute, Lincoln series, and a potential lecture series highlighting religion. Sarah and Alex are two stars in the community and are eager and creative. We love their fresh perspective. It will be a fun year. Time for trash talk once again. Trash talk inherently isn’t good. This too fits that definition. We are all volunteer. We clean the theater 120 times a year, and it is in performance shape every day of the year. We rely on our 4 trash totes in the back of the theater. Unfortunately people think those are for general use. Once again we are starting a 4 performance week with no trash availability because they are full of other people’s rubbish. We have endured our bins being stolen, used, and removed by others. This week we placed signs on our building and each bin warning they are for use by the Strand Theatre Only. This is a needless expense, a hassled, and a sad commentary of our downtown. This can change if we all work together and lower our tolerance for activity that harms our community. The question is easy, the answer is difficult. We have wonderful sound equipment. We have worked diligently and invested heavily in good equipment and quality components. After 10 hard years of use, it is starting to show its age. One big problem is mic cables (warning, tech talk ahead) The XLR cables are soldered at the connector. After constant use, the connections fail. This week we finally purchased a cable tester. Our next work session in a few weeks will be focused on checking and cataloging all our sound equipment. We are like kids in a candy store. This will be fun. We get to play with all our play toys! In the process we will find out what works, what needs repair, and what needs replacement. This will be just in time for our concerts this month. This week we had our annual fire extinguisher. All of our extinguishers are inspected and cleaned by a volunteer each month. Our vendor and supporter Crossman Fire certifies each unit every year. We passed! We added a new fire extinguisher in the fly loft above the stage. This is a good thing to add, as it means we are making progress. Have you noticed our social media posts? We want to thank our dedicated team of volunteers who diligently get things listed online. Kori H. is one of our new volunteers and she is doing a wonderful job. She is extremely qualified for the job (by virtue of being a teenager), much better than the rest of us. The Strand is a happy place. We love seeing the creativity that comes to our theater each and every week. The Shelby County Players are presenting a powerful well produced play, we hope you can attend. Next week we have music that will get you dancing the the aisles and the list goes on. This is all because of your support and generosity, thank you! See you at the Strand. All performers will be limited to 5 minutes, no exceptions. First come first serve. Limited to 20 performers per night. Performers cannot be intoxicated or under the influence. Do not heckle. Ever. Period. Use original material. Don’t read jokes you’ve seen on the internet. Do not use jokes from other comedians. RADIUM GIRLS opens tonight! In 1926, radium was a miracle cure. Madame Curie was an international celebrity, and luminous watches the latest rage – until the girls who painted them began to fall ill with a mysterious disease. Inspired by a true story, RADIUM GIRLS traces the efforts of Grace Fryer, a dial painter, as she fights for her day in court. Her chief adversary is her former employer, Arthur Roeder, and idealistic man who cannot bring himself to believe that the same element that shrinks tumors could have anything to do with the terrifying rash of illnesses among his employees. As the case goes, however, Grace finds herself battling not just with the U.S. Radium Corporations, but with her own family and friends who fear that her campaign for justice will backfire. Written with warmth and humor, RADIUM GIRLS is a fast-moving and highly theatrical. Called a “powerful” and “engrossing” drama by critics, Radium Girls offers a wry, unflinching look at the peculiarly American obsessions with health, wealth, and the commercialization of science. The Shelby County Players present this play this weekend and next. Tonight and tomorrow at 7:30pm and Sunday at 2pm. Plenty of tickets are still available. The Shelby County Players have been hard at work getting the scenery and lighting ready for their performance. The set utilizes the height of our auditorium. It is always nice to see new and creative uses for the Strand. Last week we discussed our trials and tribulations with our Coke machine. This week we are happy to report that it is fixed! It required 9 volunteer labor hours to solve a problem that took 20 minutes to fix. We look forward to not having to go through that process again. When you’re at the theater this weekend you can enjoy a Coke! We have had a stressful summer. The road construction has been detrimental to our attendance. At Friday Night Frights a patron came to us and said “you need help.” She gave us a very generous donation. Things like this reinforce our belief that we live in a wonderful community. We also had a patron inquire about a hearing assistance system. Rather than just ask, we received a very generous check to cover 100% of the system. We will be starting work soon on installing this complex hearing system. Work sessions will be needed to help with that too. On behalf of the Strand and our community THANK YOU to these generous donors. Strand Fun Fact: The Strand is located on Harrison Street and Post Street. Yes, the alley behind the Strand is actually a street. The Strand Annex is addressed on Post Street. Look at our schedule, we have something for everyone. We hope to have a great turnout for all our events. 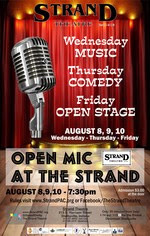 If you are interested in OPEN MIC, turn that interest into action and perform on the Strand’s stage! We do all this because of the support and generosity of our community. We had over 450 people attend Strand programs last week. This is all because of you, thank you. See you at the Strand! Tickets for events at the Strand are available at Mickey's T Mart. Tickets for select events are also available online at Brown Paper Tickets. Site Admin | WordPress Theme | Web Hosting Bluebook Strand Theatre Copyright © 2019 All Rights Reserved .